Frozen shoulder is a painful condition of the shoulder that results in stiffness and loss of movement of the joint; it is also known as adhesive capsulitis or contracted shoulder. The exact mechanism of why people develop frozen shoulder is unclear. Overall around 2-5% of the population will develop a frozen shoulder at some point. The condition is more common in in 40-60 year olds. It is seen more frequently in women and patients with diabetes, thyroid disease, hyperlipidaemia, and following heart attack or stroke. True frozen shoulder occurs without obvious cause, while stiff or contracted shoulders are seen after injuries, fractures, surgery and prolonged immobilisation. Frozen shoulder develops spontaneously over time, and during the freezing phase the movements of the shoulder become painful and the joint starts to stiffen up. The capsule, or lining, of the joint becomes inflamed and painful, known as capsulitis. Typically this takes anywhere between six weeks and nine months. The shoulder becomes stiff and is then classed as frozen. During this phase the pain generally diminishes while the stiffness remains. This period takes anywhere between four and 12 months. The shoulder “thaws” over a period of anywhere between five and 26 months, as movements start to return. Overall, the average length of time for a frozen shoulder to develop and resolve is two and a half years, ranging from one to four years, with some people noticing some loss of movement at seven years from onset of symptoms. It is important to understand the natural history of the condition, which is resolution of symptoms with time, as this aids decision making for treatment options. There is little to see in frozen shoulder, except for the complete loss of movement of the shoulder in all directions. Classically, there is loss of external, lateral or outward rotation of the joint. Any further assessment of the joint is prevented by loss of motion. An X-ray of shoulder is needed to rule out other shoulder pathology that can mimic a frozen shoulder, such as osteoarthritis or a locked shoulder dislocation. An MRI scan of the shoulder will not show any changes in the shoulder that will alter treatment and is therefore not necessary in the initial stages of frozen shoulder. The role of physiotherapy is much-debated for frozen shoulder. Physiotherapy is an essential component of treatment post-intervention (injection, hydrodilatation or surgery). Physiotherapy should only be offered if pain is well controlled, as increasing pain with stretches can exacerbate the problem. A simple steroid injection can be placed into the shoulder joint to help settle the pain from the painful capsulitis of frozen shoulder. This can be particularly useful in the early painful freezing stage, but appears to have less of an effect if placed once the pain has resolved. Hydrodilatation, or hydrodistension, is a stretching injection performed under either ultrasound or X-ray guidance. Saline is injected into the shoulder under pressure in an attempt to stretch the capsule and allow movement. Local anaesthetic and steroid are also instilled to aid pain relief. Post-injection physiotherapy is essential in a combined approach to improve pain and range of movement of the joint. The exact mechanism of how this procedure works is not known, but the clinical results speak for themselves as a number of patients benefit from it. Hydrodilatation can be repeated if needed. Keyhole surgery for frozen shoulder is performed as a day-case under general anaesthetic (asleep). The procedure removes the thickened, painful, contracted capsule that prevents shoulder movements. The surgery rapidly improves shoulder movement and reduces pain levels. Postoperative physiotherapy is crucial in the on-going treatment pathway and starts within a few days of surgery. It is also important to keep pain under control in the first few days to allow the shoulder to move. There is very little risk of infection from injections or hydrodilatation. Physiotherapy can exacerbate the problem in the early painful stage. The risks of surgery are low; there are very low risks of infection, bleeding, nerve injury and occasionally re-stiffening. 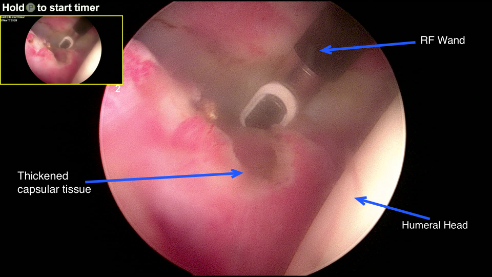 The overall results are not significantly different between surgery and non-surgery treatments at two to three years following onset of symptoms, but clearly this is at the expense of pain, stiffness and loss of function of the shoulder. 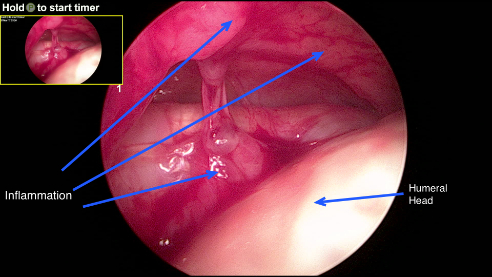 The concept of coping or not coping with symptoms should help guide patients in decision making for whether or not they decide to proceed with intervention: injections, hydrodilatation or surgery (keyhole release / arthroscopic capsular release).